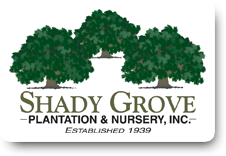 Established in 1939, Shady Grove Plantation & Nursery has been supplying top quality finished plant materials to the landscape profession for generations. The associations we have developed with architects and contractors nationwide have allowed us to place our trees on premier projects from New York to Las Vegas to Istanbul, Turkey. Shady Grove Plantation & Nursery offers a wide selection of better cultivars in hollies, southern magnolias, and shade and flowering trees. Pulling from over 1,000 acres of cultivated trees, we can offer good availabilities in a wide range of sizes. Shade trees are available from 2” in caliper, hollies, magnolias and other broadleaf evergreens & deciduous shrubs may be sold from 3’ and up, depending on variety and availability. Many of our crops have a target rotation of up to fifteen years. This enables designers and contractors to choose from a vastly diversified stock of plants that can be placed in any sized landscape based on desired size and budget. Our reputation for quality has been built through years of providing landscape materials that exceed the expectations of our customers. Expect our trees to be of superior form and vigor up top and have an excellent root system below. Soil at the nursery is generally a sandy loam to 12” in depth with light clay beneath. In addition to the fine natural growing medium, we have engineered a drip and water table control irrigation system, designed to maximize root production. The result is a root system well balanced with both fibrous and heavier structural roots, so important in handling and transplant.